The chapter explores effective ways of communicating CSR in MBA education. The authors specifically address how the interplay between a messenger (i.e. a lecturer) and a message (i.e. module content) may influence MBA programme members’ engagement with and commitment to CSR. 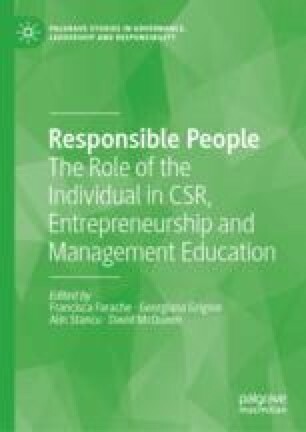 The authors suggest that if there are high levels of identification with the lecturer and higher effectiveness of CSR messages (well-designed module content), MBA programme members would be more likely to commit to CSR issues. Hence, this chapter provides a theoretical framework which could shed light on how to effectively communicate CSR in MBA education with the purpose of not only transferring knowledge, but encouraging behavioural change. Finally, the authors discuss limitations of the proposed framework and highlight future research opportunities. Henley Business School. 2017. Report to the United Nations Principles for Responsible Management Education 2015/16 & 2016/17. Accessed June 28, 2018. http://www.unprme.org/reports/HenleyBusinessSchoolUNPRME2017.pdf. Principles for Responsible Management Education (PRME). 2007. About Us. Accessed May 28, 2018. http://www.unprme.org/about-prme/history/index.php. Reputation Institute. 2018. 2018 Global RepTrak®—Most Reputable Companies in the World. Accessed June 28, 2018. https://www.reputationinstitute.com/resources/pdf/2018-global-reptrak.